The head of saxophone at the University of Western Australia, Erin Royer, will be running a masterclass for secondary school saxophinists to workshop one piece and receive invaluable feedback. Three students will be chosen to perform in the masterclass. Positions will be confirmed by 5pm, Monday 9 July. Erin Royer is a classically trained saxophonist, specialising on the tenor saxophone. In 2010 Erin received a Bachelor of Music (Classical Performance) at the Western Australian Academy of Performing Arts (WAAPA), under the guidance of Dr. Matthew Styles. In 2011 Erin completed an honours research degree with first class honours, which focused on career pathways for the twenty-first century classical tenor saxophonist. Currently Erin is the head of saxophone at the University of Western Australia, and tutors at The Western Australian Academy of Performing Arts. Erin is also the saxophone tutor for Wesley College, lumen Christi College and Mercedes College. During Erin’s studies she received many awards and scholarships. Most notable of these were receiving honouree recognition by the Dean of Education and Arts, Edith Cowan University 2009, winning the Barbara MacLeod Scholarship awarded to the top performing student at WAAPA 2011, achieving the top woodwind performer in the same year and becoming a member of the Golden Key International Society, exclusively for high achieving students.. In 2013/14 Erin moved to Manchester, UK and completed a Masters of Performance at The Royal Northern College of Music, under the guidance of Rob Buckland and Andy Scott. During her Masters Erin was selected to perform in a series of concerts with the prestigious Netherlands Blazers Ensemble (NBE). Erin was further invited to perform with the NBE for their esteemed New Years Concert at the Amsterdam Concertgebouw. While at the RNCM Erin won the RNCM concerto competition performing Jacob Ter Veldhuis’ Tallahatchie Concerto, was awarded The Stan Barker Memorial Prize for Jazz Improvisation, and during her final semester, Erin recorded her first album, receiving 100% for her efforts. This album, After the Moment, will be launched at the 2015 Strasbourg Saxophone Congress. Erin is a casual member of the Malaysian Philharmonic Orchestra and she is a regular performer around Perth, Western Australia, performing with The Oz Big Band, The Western Australian Youth Jazz Orchestra, and the exciting saxophone quartet, Just Sax. 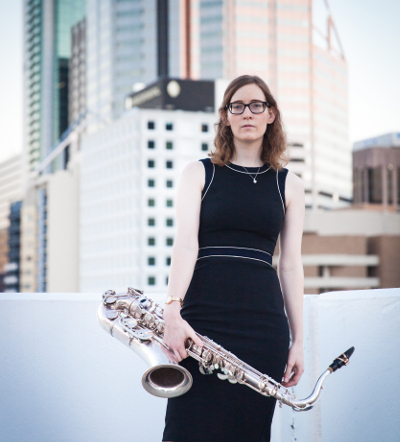 Erin aspires to become an internationally renowned performer, promoter and tutor of the saxophone and is determined, as a life goal, to make Perth, Western Australia a sought after place to study saxophone.